US oil giants Exxon Mobil and Chevron reported strong annual profits on Friday, concluding with a solid fourth quarter despite a dive in crude prices at the end of the year. Exxon Mobil reported profits of $20.8 billion in 2018, up 5.8 percent from 2017, while Chevron notched annual earnings of $14.8 billion, up 61.2 percent, capping the best year in terms of earnings since 2014. Shares of both companies surged following the earnings releases, with fourth-quarter profits topping analyst expectations for both companies due in part to higher oil and gas output. 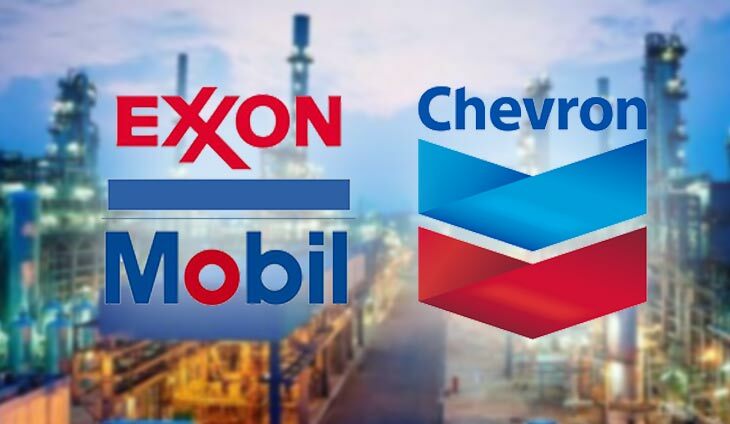 Exxon Mobil boosted its 2019 capital budget plan to $30 billion from the prior plan of $28 billion, while Chevron announced both a dividend increase and a new $25 billion share repurchase program. In the fourth quarter, Exxon Mobil’s oil output rose 4.3 percent, with increases in US and Asia oil more than offsetting declines in worldwide gas production. Exxon Mobil also notched much higher refining profits due to lower downtime at US plants and gains from asset sales, including the divestment of a plant in Italy to the Algerian state energy firm Sonatrach. Exxon Mobil Chief Executive Darren Woods said the oil giant’s business model insulated it from lurches in commodity prices in places like the Permian Basin in Texas, where oil transportation bottlenecks have been minimized by the company’s vast scale and infrastructure in the region. “Against the backdrop of fairly volatile margin and price environment, we met earnings expectations for the year and generated $40 billion in cash flow from operations and asset sales, the highest level since 2014,” Woods said on a conference call with analysts. At Chevron, oil and gas output jumped 5.2 percent in the fourth quarter. Chief Executive Mike Wirth pointed to the start in 2018 of a major new project in the Gulf of Mexico, an expansion of an Australian liquefied natural gas project and ramped-up programs in the Permian Basin. “We reached significant milestones with upstream major capital projects in 2018,” said Wirth in a statement, adding that he expected 2019 output to rise four to seven percent, excluding the effect of asset sales. Shortly after midday, Exxon Mobil shares were up 3.6 percent at $75.95, while the Chevron was up 3.5 percent at $118.60.